Imagine that you own several rental properties, and one day some of the properties get severely damaged by a hurricane. You slowly try to repair the damaged properties, but your local government decides to demolish it, without notifying you first. That is what happened to a St. Bernard Parish, Louisiana man named Glenn Sandrock. Mr. Sandrock owned approximately forty rental properties in St. Bernard Parish. One of those properties was demolished by St. Bernard Parish Government (“SBPG”). Many properties within the Parish were damaged by Hurricane Katrina. In an effort to rebuild and restore the Parish, the St. Bernard Parish Council passed multiple ordinances which made it mandatory for owners to repair their hurricane-damaged properties. Ordinance #634-12-05 basically allowed SBPG to access private property to clean debris or even to demolish the property if the property didn’t meet reconstruction/maintenance specifications established by SBPG. Mr. Sandrock received a condemnation notice during December 2006 which declared his property as a public health and safety hazard. The notice also stated that his property was scheduled for demolition. Mr. Sandrock applied for and was granted a demolition appeal in January 2007 which allowed Mr. Sandrock seven days to clean and properly secure the property. Ten days after Mr. Sandrock was given the appeal, SBPG sent an employee to the property to inspect, but without notifying Mr. Sandrock. The SPBG employee inspected the property and found that the property was not up to the standards required by the demolition appeal. 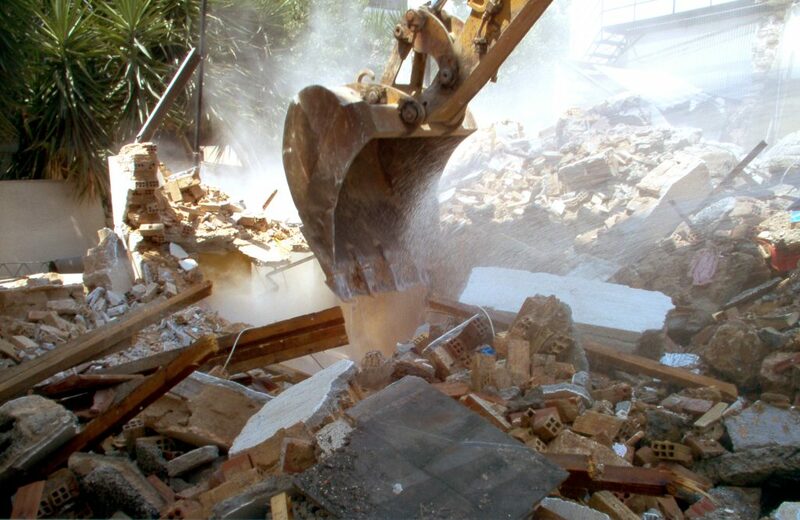 Because Mr. Sandrock’s property was still covered with debris and had not been properly secured, SBPG revoked the appeal but did not notify Mr. Sandrock of the revocation. Mr. Sandrock had no idea that SBPG had revoked the demolition appeal, so he went ahead with reconstructing and reconditioning his property. In fact, a couple of months after SBPG revoked the appeal, water was turned back on at the property, and Mr. Sandrock applied for and was granted an SBPG rebuilding permit. In January 2008, a company hired by SBPG inspected the property and determined that it had not been adequately cleaned and not properly secured. A few days later SBPG had the property demolished. Mr. Sandrock was not aware that his property had been demolished, so he went to the Permits Office to inquire about the current classification of his property. He was informed by an employee at the office that there was nothing wrong with the property. The employee encouraged Mr. Sandrock to file for a second demolition appeal, so he did, and it was granted, but the property had already been demolished! Mr. Sandrock filed a lawsuit against SBPG for damages due to lack of notification of the demolition, unauthorized taking, and a slew of other claims. The District Court ruled in Mr. Sandrock’s favor, deciding that SBPG was grossly and willfully negligent. Mr. Sandrock was awarded $161,308.00. SBPG appealed the decision to the Louisiana Fourth Circuit Court of Appeal. The issue before the Court of Appeal was whether SBPG was grossly and willfully negligent in the demolition of Mr. Sandrock’s property. La. R.S. 9:2800.17 provides that neither the state nor any political subdivision or public entity thereof that is engaged in operational decisions in the wake of Hurricanes Katrina and Rita will not be liable for property damage except in cases of gross negligence or willful misconduct. The Louisiana Supreme Court defined gross negligence as “want of even slight care and diligence” and the “want of that diligence which even careless men are accustomed to exercise.” See Ambrose v. New Orleans Police Dep’t Ambulance Serv., 639 So.2d 216 (La. 1994). The Louisiana Supreme Court also stated that there is no clear distinction between gross negligence and willful misconduct and that the two terms have taken on the same meaning. The Court of Appeal ultimately decided that the District Court was correct when it ruled that SBPG acted grossly and willfully negligently when it demolished Mr. Sandrock’s rental property without providing notice. The Court of Appeal reasoned that SBPG was grossly and willfully negligent, because Mr. Sandrock never received notice that the demolition appeal was revoked, he received a rebuilding permit after the demolition appeal was revoked, the water had been turned back on in the property after the appeal had been revoked, an employee at the Permits Office informed him that there was no problem with the property, and SBPG approved a second demolition appeal application after the property had already been demolished. SBPG should have notified Mr. Sandrock before it demolished his rental property and a good lawyer helped Mr. Sandrock get the compensation he deserved. Although the government and governmental entities are given great discretion in carrying out duties, they can’t go around tearing down or demolishing the things you have worked hard to build; well not unless you are notified first.